Chances are, you have heard that the Texas Legislature is in session. This is actually unusual, because the Leg only meets for 140 days every 2 years. They started in January, and after a lot of waiting, hearings, debates, and of course press conferences, the Leg is now in the final sprint of the last 30 days. Legislation is moving so fast, sometimes it is hard to keep track. In this episode, we will look at the flow of legislation, and what that means for mental health policy. Trying to explain the deadlines and procedures can be tough. So, I wanted to share with you a sample calendar for the month of May. You can download this one page PDF by clicking here. The Texas Legislature began its session on Jan. 13. With bemused expressions, representatives and the House clerk barely spoke as bills got their final passage and Angleton Rep. Dennis Bonnen, acting as speaker, spoke so rapidly that he sounded like an auctioneer. University of Houston political science professor Brandon Rottinghaus said the problem comes from having a legislature that only meets for 140 days every two years. “The other problem is that they’ve got to get it through both chambers and get it to the governor and have some consensus on it, publicly. So that’s going to be the kind of thing that really makes them rush,” he said. Committees have already done a lot of the heavy lifting. And Rottinghaus said the House is playing a bit of catch-up to the Senate. “Because they’ve got to be able to get their agenda, in addition to being able to play defense against the Senate agenda. So that’s, I think, why we’re seeing a bit more motion here in the last few weeks in the House,” he said. Gov. Greg Abbott has until June 21 to sign or veto bills passed during the regular session. Navigating the legislative process is always tough, but luckily there are very experienced advocates who dedicate themselves to understanding the process and pushing for better policy. Before we get into the weeds of the legislative process, I thought it best to start with the one bill that has to pass every session: the budget. As we’ve examined on previous episodes, the recent investments by the State Legislature in mental health services is set up against the backdrop of an underfunded and overburdened system. Last legislative session, an increase of over $350 million was put into our mental health system, marking one of the largest increases in mental health in the state’s history. This session, the Legislature is poised to continue that progress, and a recent article in the Texas Tribune looks to illustrate the point. The article looks at the Senate and House versions of the budget known as “CSHB 1,” which stands for the Committee Substitute (or amended version) of House Bill 1. It’s the big appropriations list that is debated in House and Senate Committees and finally by the entirety of each chamber. Not surprisingly, the House and Senate don’t always agree on budget priorities. And by “always agree,” I really mean they both have strongly held & very different opinions about how state government should be funded. 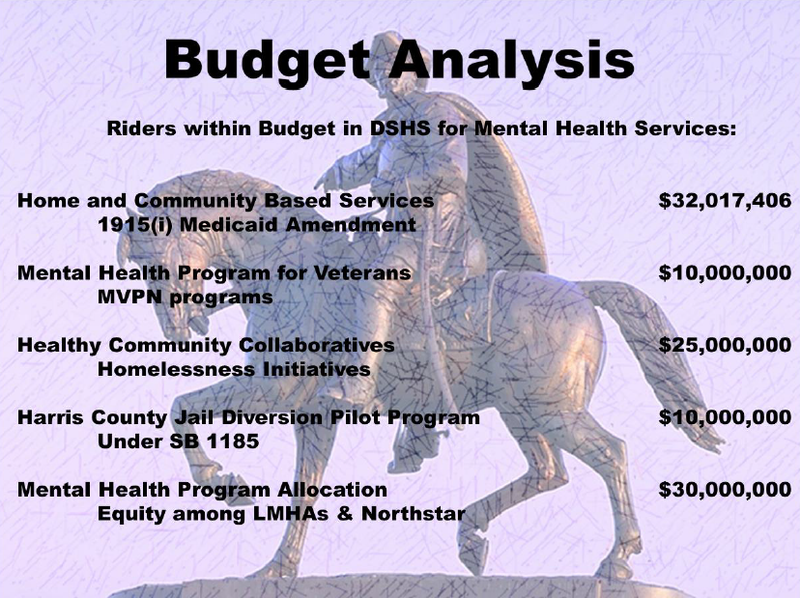 The article shows that in the House budget, mental health services are funded at $3.8 billion for the biennium, and increase of $304 million from last session. Over in the Senate, they fund the same services at for $3.7 billion, increasing investments by almost $250 million. The first thing bit of good news out of this is that both chambers realize our state needs to spend more to increase access, and the debate now turns to exactly how. 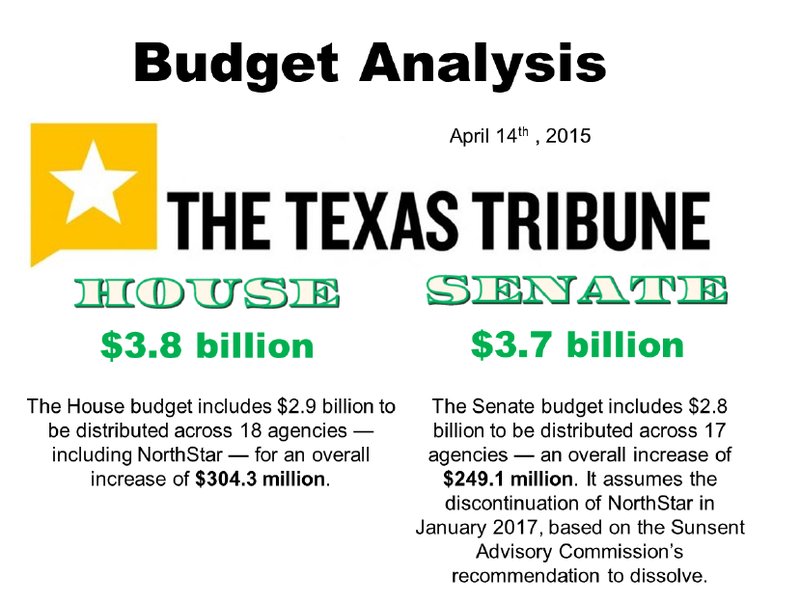 The primary difference is how chambers differ on funding NorthStar, a Medicaid service unit for mental health and chemical dependency services in North Texas that was hotly debated by the Sunset Commission report. The Senate version of CSHB 1 actually offers $8.4 million more than the House version for mental health services for adults, $1 million more for children’s mental health services, and $4.2 million more for community crisis services. 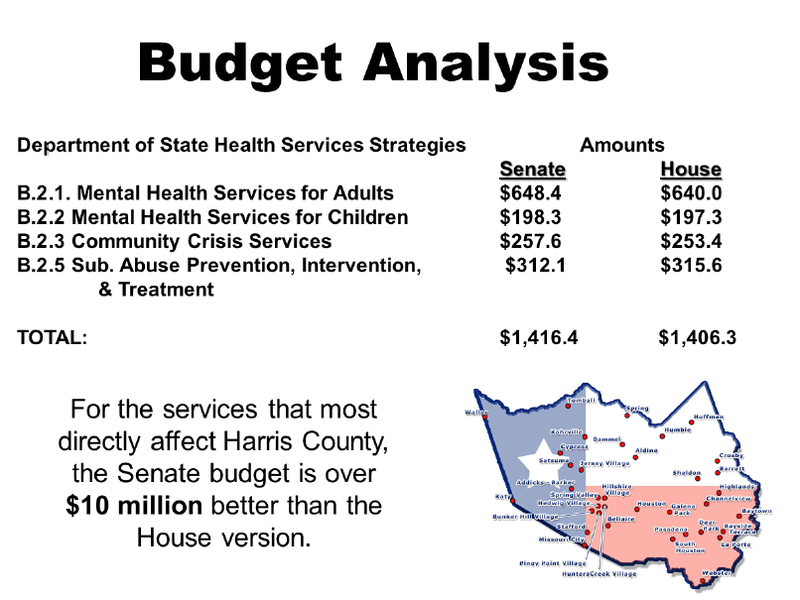 My point in this is you have to look deeper than just the headlines if you want to really understand how these budget numbers can affect mental health policy in Houston. Another way to see this aside from these strategy totals is to look at the riders contained in each version of the budget. Each of these rides helps specifically address a funding stream that will help Harris County and our local Mental Health Authority to provide more access to mental health services. 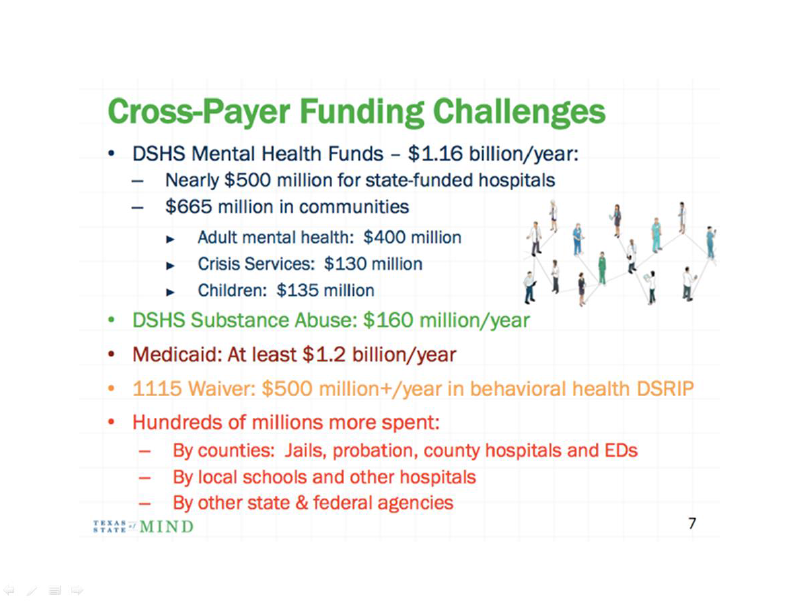 Now, just to make sure everyone is on the same page, I’ll include a slide from our friends at the Meadows Mental Health Public Policy Institute that talks about the Cross-Payer Funding Challenges with mental health funding so you can see why these strategies and riders are so important to services in Harris County. Finally, I’d like to share some good news for folks in Harris County. Because the passed versions of the House & Senate budgets are different, each chamber will appoint 5 conferees to negotiate on behalf of the chamber. On the House side, Chairman John Otto, Vice Chair Sylvester Turner, and Appropriations Member Sarah Davis are all House conferees from the Houston area. That’s a big win. On the Senate side, Finance Chair Jane Nelson, Health & Human Services; Chair Charles Schwertner; and Senator Juan “Chuy” Hinojosa are all big mental health supporters who are set to fight for better funding. These conferees have the biggest say so on the budget, and fortunately we have a great line up to fight for mental health dollars. Now, I’d like to turn from the budget to other pieces of legislation. As I mentioned before, we are lucky to have some great advocates who monitor and report on the progress of legislation and work tirelessly during the interim to build support for new initiatives. Kelly: Sitting here today in Austin, Texas with Katherine Ligon who is a policy and budget analyst with the center of public policy and priorities. Thank you so much for taking time out for us. I know you have been monitoring the legislative process quite closely as it goes on. Everybody that studies health policy in Texas knows how good CPPP is with regards to data, research, policy analysis. What role do you play here with CPPP? Kelly: Perfect, perfect. And I have seen you at every single hearing that I have been to in Austin since this session and I know sessions before. How is it, just from your perspective as someone who studies this really intently, has the legislative mood changed when it comes to how they address and how they talk about, rather than just a single piece of legislation, just over all given you deal a lot with those state of budget matters about it. 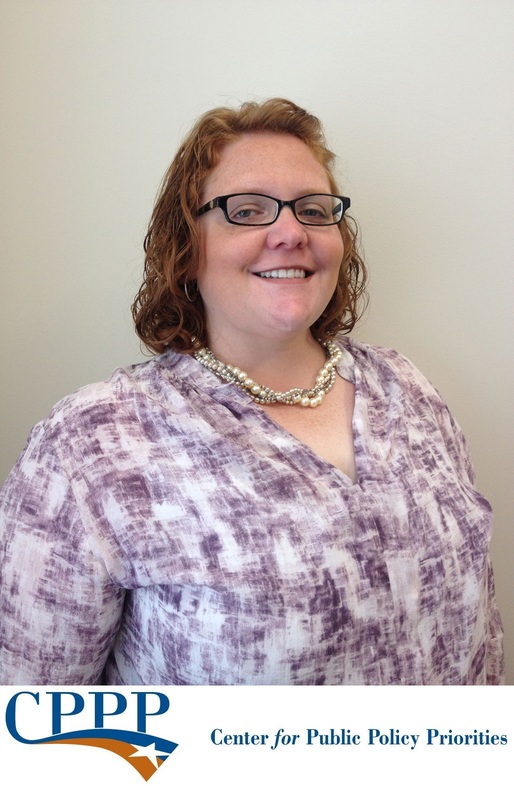 Does the legislature feel differently about mental health than they used to? Ligon: Absolutely. I think that there’s been a tremendous recognition that mental health and substance use is really important in ensuring that have access to appropriate care and that really comes with partnering with some unusual suspects, in particular with the Sherriff’s Association, with Texas Association of Counties and Conference of Urban Counties. Those groups have been really a strong force in ensuring that the state maintains the responsibility in ensuring that the public mental health system is well-funded and that we have good public policies to ensure that the money is used appropriately and effectively but also that there is good public policy for quality services. We’ve come a long way in that conversation as you likely are aware that the state has been categorized as being 49th as far as per capita funding foe expenditures for many years. We are really far away from the median and that’s what been most disconcerting but we are getting closer to the median. Kelly: Good deal. As you look at it with a perspective of someone that is involved in it day in and day out if there was one thing this legislative session that the legislature is really looking to focus on and has that opportunity here in the last month what would that one thing be? Ligon: I think that there is a lot of concentration on the workforce. There is a lot of concentration in particular because as a result of some studies, interim charges that looked at workforce issue it was highlighted that there is a significant workforce shortage and so there are several efforts trying to ensure that providers are practicing at the highest level of their practice act and that they are opportunities for loan reimbursement for providing Medicaid related services or services within low income areas and also that the workforce is robust, that we are concentrating on everyone from psychiatrists to social workers but also ensuring that primary care physicians have a good understanding and knowledge base of mental health and substance abuse issues. 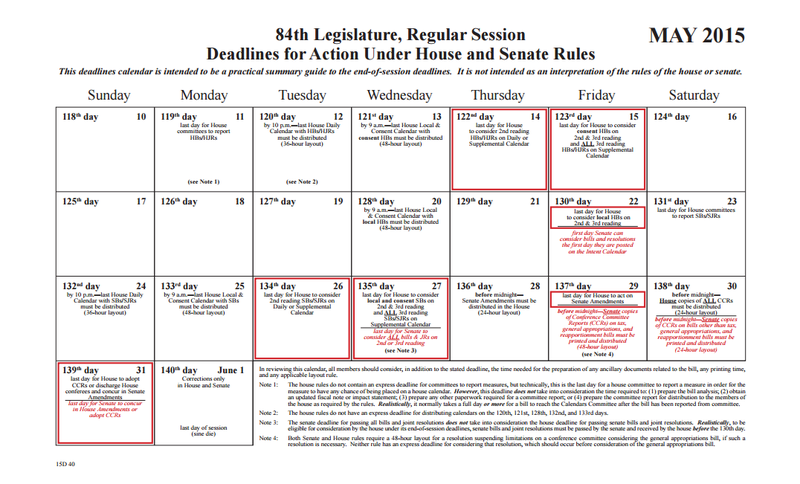 As you can see, there has been good progress on a number of bills, but from the earlier calendar we posted, I would point out one big upcoming deadline: If a bill is not heard on the House floor by Thursday, May 14th, then it’s stand alone status is dead. While it can still be offered as an amendment on another piece of legislation, the upcoming deadline does tend to kill stagnant bills. Over in the Senate, Senate bills can be heard up until May 27th and the system of rules is much more flexible, but the point remains the clock is running out. MHA of Greater Houston will continue to work to monitor and advocate for these bills along with further budget negotiations. There are going to be late nights and tough calls, but remember the Texas Legislature only meets once every two years. So now is the time to get things done. For Minding Houston, I’m Bill Kelly. Music from New Midnight Cassette System by Frank Edward Nora (host of The Overnightscape). To listen to the Houston Public Media podcast used in this episode, listen here at HoustonPublicMedia.org.